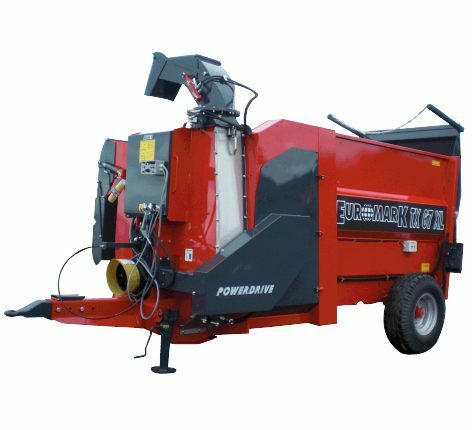 EUROMARK TX47 / 57 / 67 / 87 and 107XL compact straw blowers guarantee you a comfortable mulch autonomy. With a useful capacity going from 3.8m³ to 9.66m³, they allow you to load several bales with minimum clutter. With a great adaptability, they are available in various versions in order to suit every buildings’ configuration and all needs. Or in double chutes (lateral chute + 320° swivelling chute). Our TX47 / 57 / 67 / 87 and 107XL compact straw blowers are equipped with 2 mechanic feed rotors (except TX47XL = 1 rotor) and benefit from S.D.E. technology. This Strung Bale Distribution ensures high quality mulch. 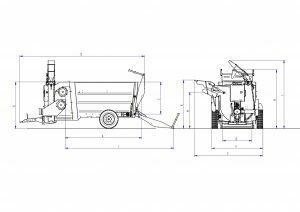 To distribute difficult products, all models can be equipped with POWERDRIVE system, carrying system by hydraulically disengageable belt – EUROMARK patented innovation. A broad choice of options expands this machine’s equipment, in order to ensure you an efficient and performing work instrument, adapted to your daily needs. 30°/30° Rotating laterale chute (optional) // The rotating laterale chute with a 30° angle on each side of the machine eases mulch and enables the mulch in hard to reach area. Double chutes // lateral chute + 320° swivelling chute // To deal with complexe buildings configuration, EUROMARK compact straw blowers can be equipped with a 320° swivelling chute, able to mulch up to 15m far. Its 3-elements conception gives the possibility to mulch close to the edge of the machine. The 320° swivelling chute completes the lateral chute, therefore the machine provides double chutes. Patented system POWERDRIVE // EUROMARK exclusive (optional) : Developing maximum power for the feed rotor, this flow system with hydraulic disengaging belt enables the separation between the turbine’s and the bale seperator’s rotation, and the belt’s movement. EUROMARK exclusive patent. Lateral chute, mulch between 18 and 20m (according to straw quality). Double chutes (lateral chute + 320° swivelling chute), mulch up to15m (according to straw quality). TX47XL : available with 1 S.D.E. mechanical feed rotor or 1 hydraulic feed rotor. TX57 / 67 / 87 and 107XL : only available with 2 S.D.E. mechanical feed rotors.